In a four-handed game, I limped with from the small blind. VenturaBay raised to 400 from the big blind and I called. I like to limp 100% of my small blind versus big blind range. With this hand it’s an easy limp call, or sometimes a limp raise, depending on my opponent’s gameplay. The flop is , which is a really good dry board. I usually like to check-call most hands in this situation, particularly when I hold an in my hand or even a high. I checked and VenturaBay bet 222. I called. The turn is the , and here I know that if I check and my opponent checks back then I most likely have the best hand. I check and, luckily for me, VenturaBay checks back. We go to the river and it’s the . If I decide to bet here my opponent could easily bluff-raise me out of the hand. My hand is strong enough here to check and win most of the time, meaning I don’t have to risk betting on the river and getting pushed out of the hand. I like to play like this because it is more profitable in the long run. I always think a few steps ahead before making a decision, something that poker players should aim to do all the time. So I checked, and once again VenturaBay checked back. If he would have decided to bet I would definitely call depending on his bet size. If half the pot or two-thirds I would call, but if he would overbet I would have folded my hand. In the end, I won the pot with the best hand – high! In a four-handed game, NenePoker limped from the small blind. I checked from the big blind with . For value, because it’s a limp pot and it’s hard to make a pair. In this case l have the top pair in a heads up situation plus a gutshot. By raising I get to keep my bluff range like all my straight draws and flush draws. So I raised to 900 and NenePoker called. The turn is the , and this is where things get interesting. 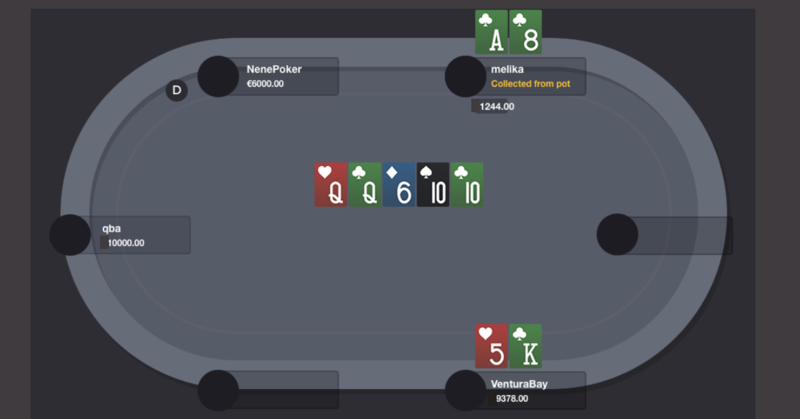 NenePoker decides to donk bet the size of the pot, which is 2,000. My hand has improved to two pairs and it’s not hard to call since I don’t believe he would make that move with nuts to get me out of the hand. With this bet size, I don’t think he is polarized, so I put him on draws, two pairs, or air. I called and the river is the . 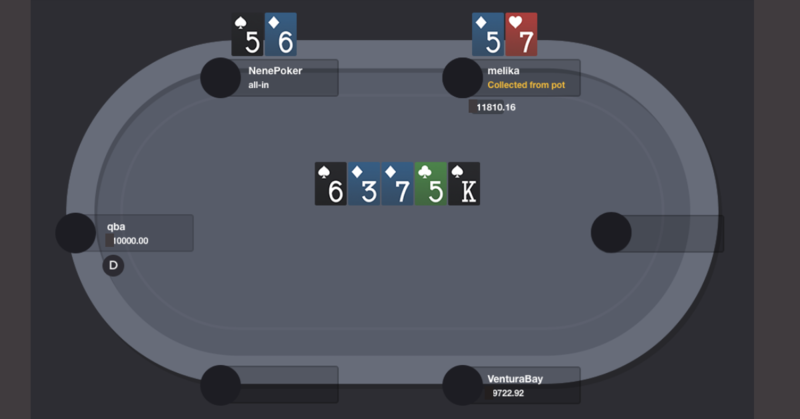 NenePoker goes all in with almost half of the pot – 2,905 into 6,000. I decided to call because the river didn’t complete the flush and, as I thought on the turn, I don’t believe he has a straight. I also don’t think he would donk bet all the way with nuts. If he would have more chips and he would decide to overbet the pot then I would have probably folded my hand. But for less than half the pot it’s a definite call with two pairs. I called and he had , a lower two-pair hand, and I collect the pot.